If you've decided to make AdWords part of your digital advertising strategy, or are curious how it can be used, this post will detail seven types of campaigns you can run to deliver fast results. Campaigns are the highest-level of organization in AdWords. Ad groups and their ads all share a common budget within a campaign and some targeting settings must be configured at the campaign level. Without further ado, let's get into the seven campaign types you can launch to fill your funnel. It's no secret that people, businesses, and needs vary greatly across the world. Because of that, a one-size-fits-all approach to digital advertising is rarely best. Simply put, the same keywords may cost less in different regions. If you're bidding on the keyword "digital advertising companies" in a campaign that is not geographically-bound, you're almost certainly overpaying. 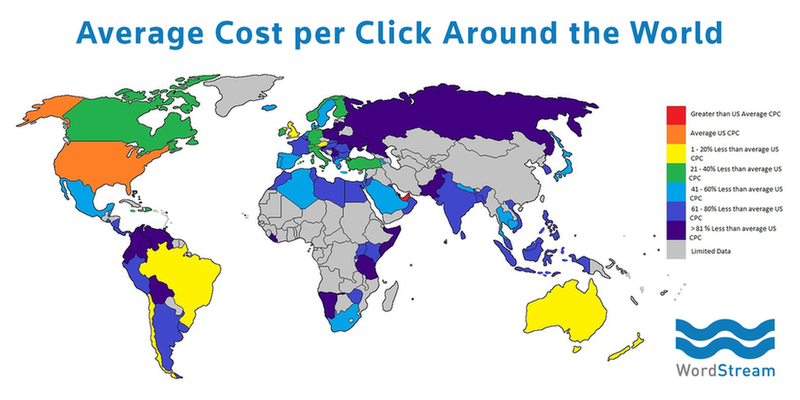 Keywords tend to cost more in the United States and Europe, and less in other regions of the world like Africa, APAC, and South America. It's well worth your time to run an experiment by splitting an existing campaign into different geographies, and measuring over time if you're realizing cost savings by doing so. One of the things I've found in running ads in different geographies is that people use slightly different words to describe the same thing in different places. These idioms might for example, be the different ways that people describe the concept of "small". Think about some of the synonyms for small: mini, compact, tiny, puny, and little. In some regions people might refer to a product as "mini", while others call it "compact". That's one of the local language differences I've seen. What I mean by "vertically targeted" is targeting your ads at prospects in specific industries or use cases. For example, in the scientific space it makes sense to develop content for specific applications, and then use ads that include keywords related to those applications to generate traffic and leads. Or, if you're a consulting company, you can further develop your presence within a market by targeting something like "aerospace engineering". By going after a vertical, you're offering a very specific and relevant product or service to your prospects. These people will be much more likely to respond if they see an ad that is curated to their specific interests or line of work. From a cost perspective, you can save money by going after a more specific variation of a keyword. There's likely to be less competition you're bidding against if you are in a more niche space and so the CPCs will usually be lower. Not to mention the competition rating goes from high to low! Sure you're getting less impressions and clicks with this approach, but if retail business analytics is what you excel in, the leads you get from these ads will be much higher quality. If you're going to compete in AdWords, you'd be missing a huge opportunity if you didn't keyword target the literal words of what you do or sell. If I sell "women's Nike shoes", I'm obviously going to want to reach people searching for "women's Nike shoes". AdWords provides you with the opportunity to show up right in front of prospects who are actively looking for exactly your products or services. That's the true power of digital advertising and specifically Google's search ads. Your business is there to solve someone's problem right when they're looking for a solution. With search ads you pay money and get money in quick succession. You're likely to face your steepest competition when launching this kind of campaign because the barriers to entry for competing on a core product or service keyword are lower. Not everyone can do "retail business analytics", and there's a broader universe of those who do "business analytics". Despite the heightened competition and heightened costs, it's a good idea to compete directly on your product or service keywords. Can you legally mention your competitor's name or their product's name in AdWords copy? NO! (Well, except for some exceptions). But, you can bid on the company and product names of your competitors. This strategy presents a high-risk, high-reward scenario. The risk comes from showing your chosen competitors that you are willing to go head to head with them on their home turf (you're showing up in results for people who are looking for them, after all). On the extreme end, I've seen ads saying things like "We're Their Top Competitor" or "Our Plumbers Work Twice as Hard". Your competitor may respond by bidding on their own keywords. Since they can use their name and the names of their products in their ad copy they will naturally have a higher Quality Score and can make it too expensive for you to keep running the ads. Furthermore, you may not notice your budget for these placements maxing out on every click until it's too late and you've spent all your money fighting a battle you unknowingly instigated. Once you've provoked your competition, they might decide to give you a taste of your own medicine. They may decide to start running ads on YOUR brand and stealing your valuable clicks all the while driving up costs for your own branded keywords. A fight started on the playground can certainly be finished after school. Meaning, you may engender a renewed sense of competition amongst your opponents and they can come after you with a vengeance outside of AdWords. When it works, you've captured a click, lead, or customer that was on your competitor's doorstep. If somebody is looking for a specific competitor or product they might be open to alternatives and if yours is presented along with compelling differentiation, you may be able to steal their attention. I've seen this work in my own campaigning, and have fortunately not had any negative experiences with competitive retribution. This means bidding on your own brand or product names. While it may seem counter intuitive to bid on your own brand because you rank #1 organically, some of the best in the business do it. If you recall the picture from the top of this post, you can see that even Google runs AdWords on their own search engine for the keyword "Google AdWords"! Perhaps the most compelling benefit is the ability to always be the #1 result for very low CPCs. Because you can use your brand and product names in your ad copy and your competitors can't, you can achieve 9/10 and 10/10 quality scores which drives your costs way down. Clicks for your own brand name may only cost $0.25, which is very cheap compared to most of the keywords you're likely bidding for. Furthermore, an ad such as this should link to a dedicated landing page that's free of distractions and compels the visitor to complete your desired action. People going to your homepage from a search result have lots of options to navigate around your site, but a dedicated landing page gives you a good shot at nabbing a conversion. Remarketing campaigns are different from other search campaigns in that they target people whom you know have already visited your website. With a typical search ad, you have no control over who types in a keyword and sees your ad. But by limiting to a remarketing audience, you can ensure the audience is filled with familiar faces. Since these people have already been to your site and know about your brand, I think it makes sense to treat them differently than everyone else. While you can remarket with search ads, I see their primary value in display advertising. 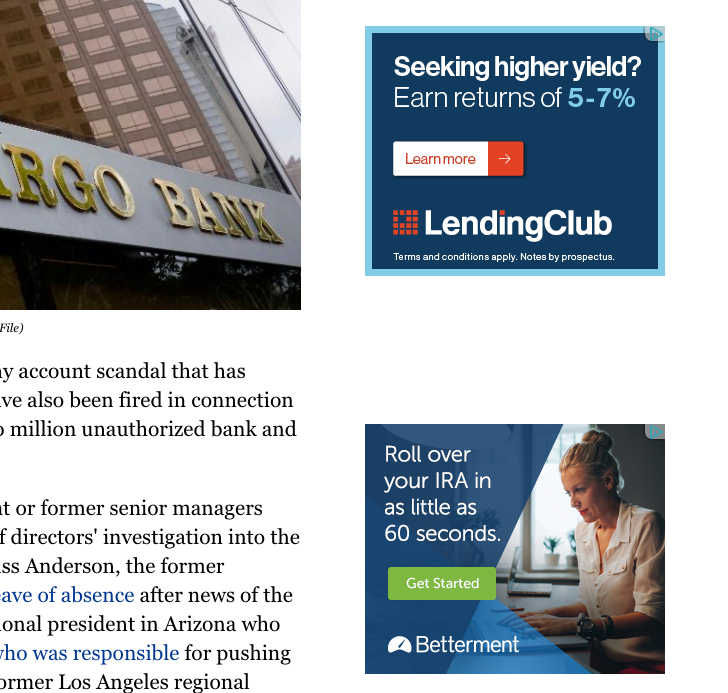 Display ads are banner ads on other websites that through remarketing appear to "follow" you. I think display ads are well-aligned with remarketing because people who see display ads are in a different mindset than those searching for something on Google and seeing a search ad. When using Google Search, the prospect is in an active problem solving mode where they are specifically looking for a solution to an issue they're experiencing. When they're seeing display ads on other websites, they're on those sites doing something else. Maybe its browsing, maybe its catching up on news - it's certainly not actively looking for the product or service you sell. While in this passive mindset, your ads can appear and take advantage of the good old Rule of 7. I haven't experienced tremendous click-through rates with remarketing display ads, but they've been very effective in growing our volume of conversions. People at different stages of the buyer's journey have different goals in mind. 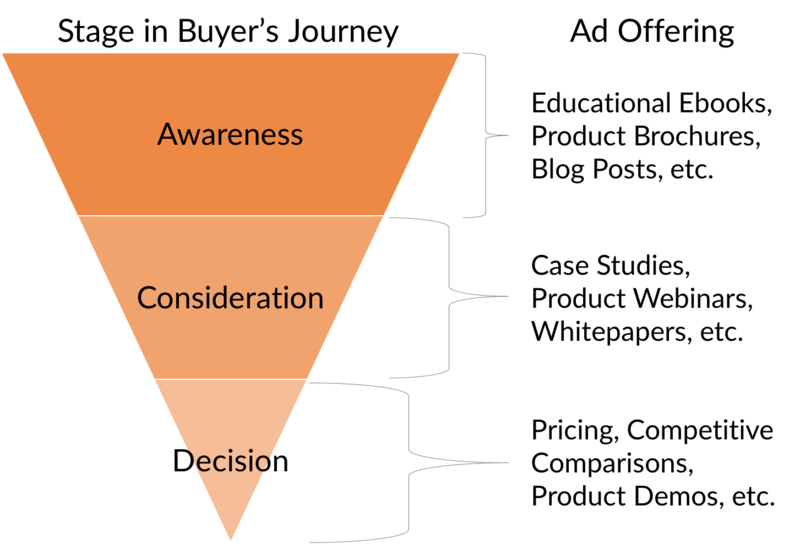 Putting on our inbound marketing hats, it follows that people at different stages of the buyer's journey have different intentions when they type their queries into a search bar. How can you tell where a prospect is in their journey? Your Search Terms Report provides a valuable list of the actual words that are triggering your ads. At the most basic level, you can often see a division between buyers in the beginning of their journey and those at the end by the adjectives or nouns they use around your target keywords. For example, the query "product/service" + "price" or "costs" indicates that this searcher is further along in their journey. They wouldn't be looking for economic information about your product or service if they weren't getting close to buying. The moral of the story for this campaign type is that you need to advertise different offerings based on your searcher's position in their buyer's journey. If your ad offerings are aligned with your user's stage in their buying journey, you will provide a much more relevant experience that will increase the number of conversions from your ads. So what do you do once you've converted these valuable new leads? Take a look at this post from Sleeknote to understand how to map your email messages to your buyer's journey. Establishing a diverse portfolio of campaigns ensures you won't miss opportunities to drive valuable clicks to your website and generate high quality leads. By implementing these seven AdWords campaign types you're tapping into the relevance of people in different industries, different mental states, and different points in the buying cycle. Are there other campaign types you've had success with? Let me know in the comments! I'll catch you in the next post.